In the movie Heat (1995), former SAS member Andy McNab was brought in to advise on weapon choices and train the actors how to use them. Guns and movies–they go together like apple pie and cream. 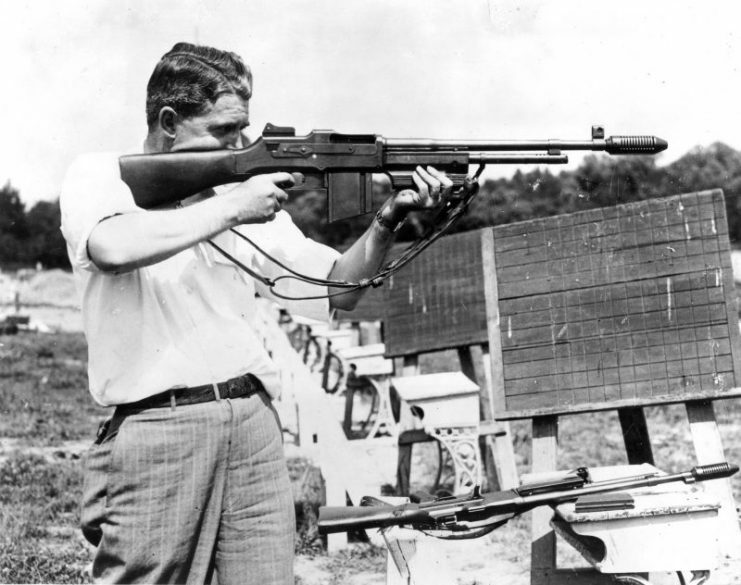 From the very earliest moving pictures, directors realized that guns added action and excitement to a story, making it surprising and a little disappointing that so many movies and television shows continue to get firearms so badly wrong. Whether it’s the use of anachronistic guns or just silly firearm handling, poorly used guns can harm the suspension of disbelief that’s essential to enjoying a film or TV show. This isn’t by any means a comprehensive listing and is more a rumination on the general theme of guns in movies and television. You could argue that firearm anachronisms and mistakes in movies don’t really matter. My wife often insists on this when I try to helpfully point out some piece of gun lunacy when we’re watching a movie together. I disagree–if a film is going to engage my interest, anything that makes me think that the director or actors don’t care enough to do basic research undermines my enthusiasm for the film. Some directors seem to care about guns. Sam Peckinpah, for example, was always very careful to use only period-appropriate guns in his films and was one of the first to try to realistically show what guns do to the human body in movies like The Wild Bunch (1969). Michael Mann also seems to have an interest in making sure that his films portray realistic use of firearms. In the movie Heat (1995), former SAS member Andy McNab was brought in to advise on weapon choices and train the actors how to use them. And it shows–the climactic shootout between the bank robbers and cops is an action-packed classic. 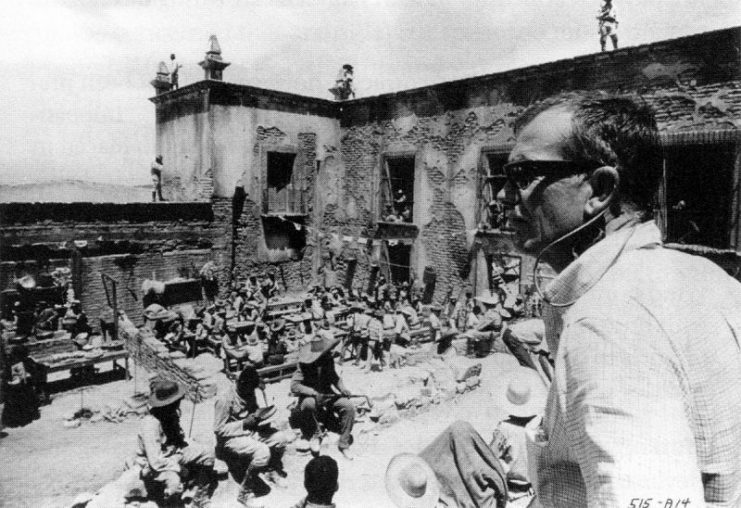 The director sets up the climactic gun battle sequences at “Agua Verde”, The Wild Bunch (1969). 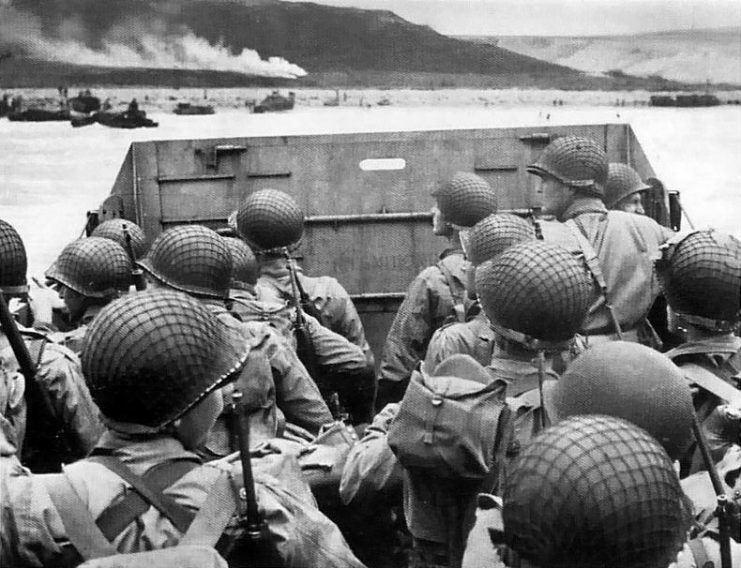 When preparing to film Saving Private Ryan (1998), director Steven Spielberg insisted that the main actors spent six days going through an arduous boot camp, including weapons handling supervised by marine veteran Captain Dale Dye. That’s one of the reasons that the actors look comfortable with their guns, while Spielberg was also notably very careful about the weapon choices. When Spielberg went on to make the acclaimed HBO miniseries Band of Brothers (2001), he brought Dale Dye back to organize another, even more arduous ten-day boot camp for the principal actors. Consequently, the combat and the actors’ ability to realistically handle their weapons is a notable feature of the miniseries. However, it isn’t always the obvious movies that provide the best guns. The Mummy (1999) is a rollicking schlock-horror in the best traditions of the genre. It stars Brendan Fraser as Rick, an ex-member of the French Foreign Legion who fights a long-dead Egyptian priest during the early 1920s. Rick dual-wields a pair of French Chamelot-Delvigne Model 1873 revolvers and uses a Lebel M1886 rifle, a Winchester Model 1897 shotgun, and a Colt M1911 pistol. 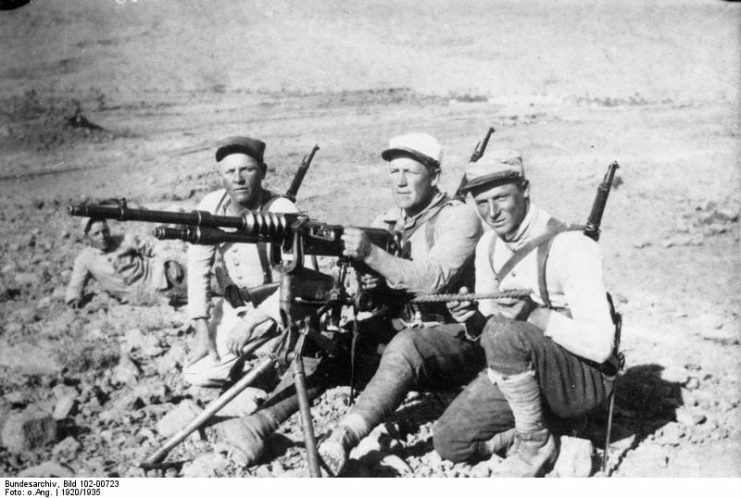 All period-perfect and absolutely appropriate for a former member of the Foreign Legion. Does that really matter? Possibly not, but if you know what you’re looking at, it tells you that whoever was in charge of choosing the guns for this movie actually cared. I appreciate that, but I was a little disappointed that in the sequel set in 1933, The Mummy Returns (2001), Rick uses a Browning High-Power pistol which wasn’t introduced until 1935. Some actors are also notably better than others when it comes to handling guns. Keanu Reeves, for example, may not be lauded as the actor of his generation, but he clearly knows his way around guns. Check out any of the John Wick films to see him in action. Rather than picking out specific movies or directors, I’ll instead mention some of the most persistent and irritating errors in gun handling from movies and TV. The sound of the hammer being cocked on something like a Colt Single Action Army revolver is incredibly evocative. Yet some directors seem to want to use these sounds to ramp up tension, despite this being inappropriate for the firearm being used. 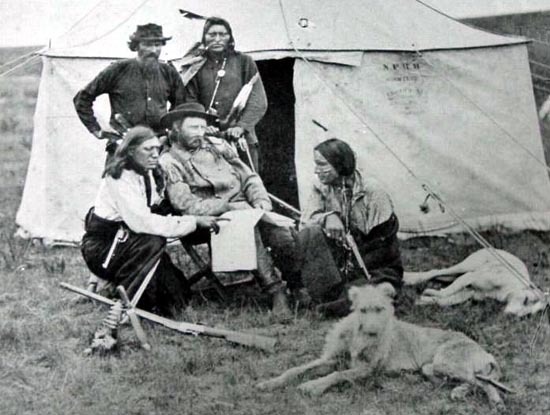 George Armstrong Custer with Indian Scouts during Black Hills expedition of 1874. 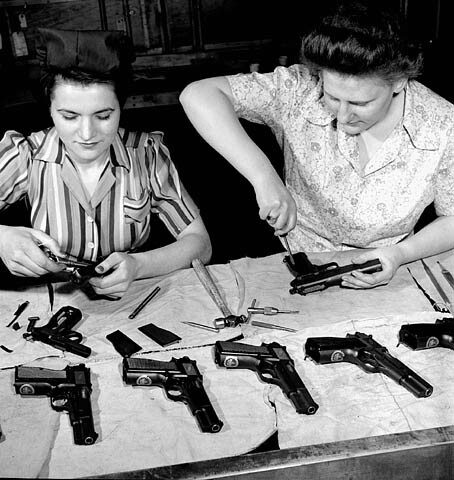 Note Colt pistols. I have lost count of the number of films where we hear the hammer being cocked or the manual safety being released when the gun in question is a Glock. Glocks don’t have hammers, and the vast majority don’t have manual safeties. A Glock only makes a sound when you pull the trigger. If you want to see this on-screen, try virtually any episode of the Fox series Sons of Anarchy. In many movies, characters rack the slide on a semi-auto pistol (or pump a shotgun) as a kind of shorthand to tell us that action is about to follow. In truth, no soldier, Special Agent or Police Officer would go on duty without a round already in the chamber. This is redundant and shows a basic lack of understanding of the use of firearms in combat. My award in this section would probably go to British Sci-Fi series, Doctor Who, where in one episode we hear the sound of a slide being racked despite that fact that the character is using a revolver! One of the basic tenets of firearm safety is to keep your finger off the trigger until the sights are on the target. There is good reason for this even on the shooting range, but it’s far more important when using a firearm in a hazardous situation. Humans are provided with a thing called the startle reflex–when we’re surprised, our bodies react by doing various things involuntarily, including clenching the fingers. If you are surprised while your finger is on a trigger, you are going to pull that trigger whether you mean to or not. 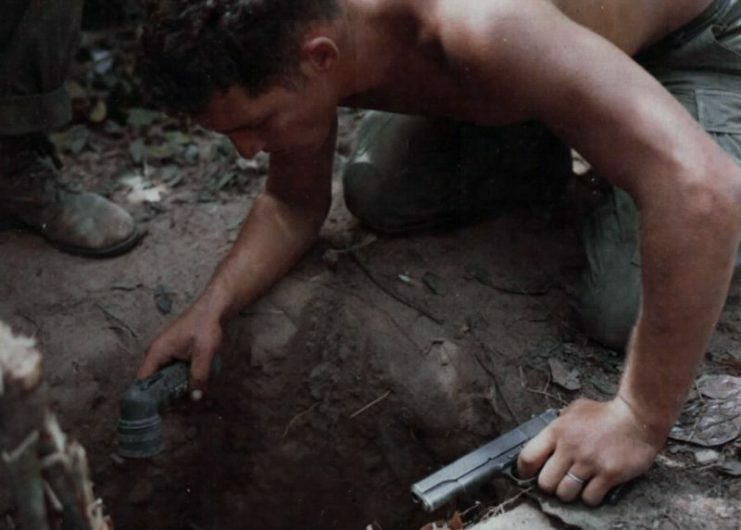 An example of not following the proper trigger discipline (the soldier’s finger is on the trigger); the pistol could also be pointed in the direction of non-targets. 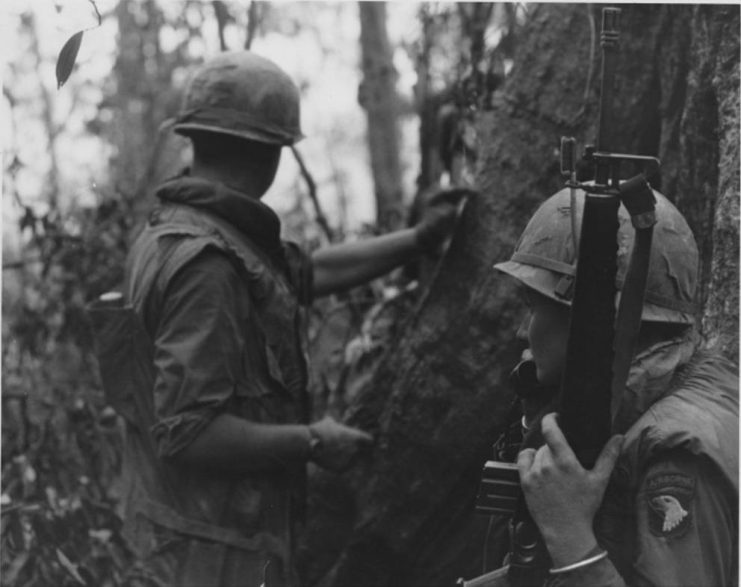 Vietnam War, 1967. So, sneaking through a semi-darkened warehouse looking for bad guys with your finger on the trigger would be a very bad idea indeed. If you are surprised, you’re liable to fire in the direction of wherever the gun happens to be pointing at the time. 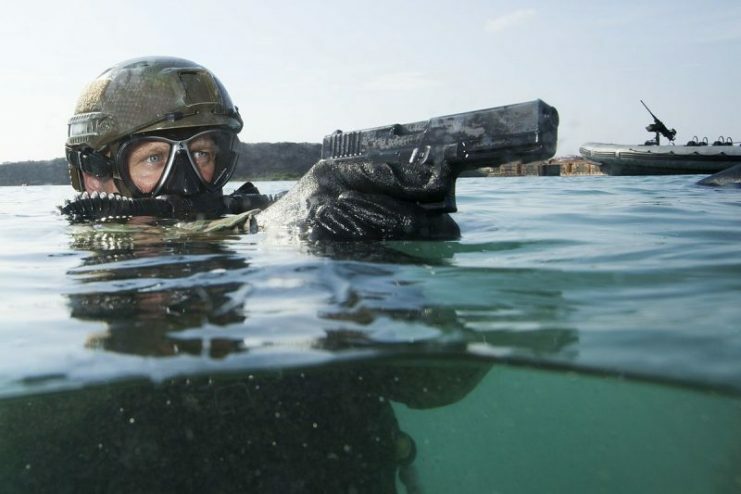 Nonetheless, I have lost count of the number of movies with actors playing supposedly highly-trained military, police, or Special Service operatives who appear to have entirely forgotten this basic rule. I could add many examples of guns which seem to have a never-ending supply of ammunition, silencers which make guns go ‘phut,’ or totally steady views of distant targets through telescopic sights, but I’m losing the will to live. Instead, I’ll finish with my personal favorite example of silly gun handling in a movie. In The Green Berets (1968), an elderly and overweight John Wayne whose mind was clearly on other things plays an unlikely Green Beret Colonel in Vietnam. Aside from the fact that virtually every soldier in the movie runs around with a finger on the trigger at all times, Wayne’s character decides to disable an M16 rifle to stop it falling into enemy hands. He does this by smashing it against a tree. 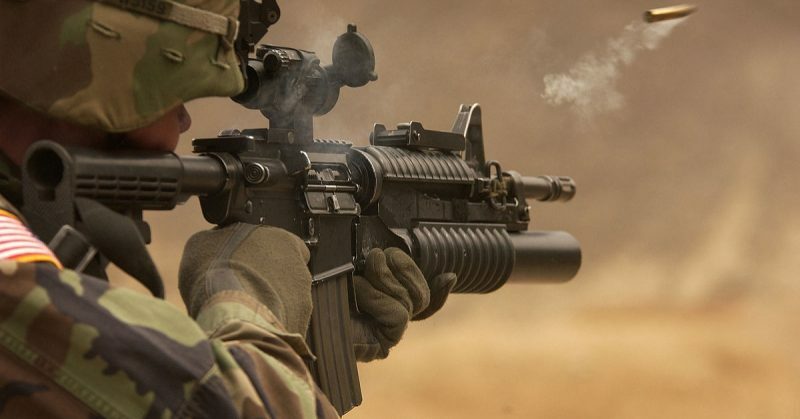 If you have ever handled an M16 you’ll know that you could probably drive a tank over one without doing it serious damage, and I doubt that even the Hulk could smash one by hitting it against a tree. It’s painfully evident that Wayne is actually breaking a Mattel M-16 Marauder, a plastic toy. There are so many other examples of poor gun use in movies, and I could probably cite several hundred more. What are your favorite examples of anachronistic, unrealistic, or badly handled firearms in movies or television?